City of Lies might not have completely won over my heart, but I will however give it the award for the most intriguing opening line I’ve read all year. “I was seven years old the first time my uncle poisoned me,” begins our protagonist Jovan, who is one half of a pair of highborn siblings whose family the Oromanis have long been entrusted to serve a sacred duty. Their job can be likened to that of Secret Service, keeping Chancellor Caslav of Silasta and his nephew Tain safe from unseen threats, though recognizing signs of poison is their specialty. From a young age, both Jovan and his sister Kalina have been trained by their uncle, the spymaster Etan, to identify all kinds of harmful substances, which sometimes involved being poisoned themselves in order to learn and become inured to their effects. But due to Kalina’s poor health, it was Jovan who was ultimately given the role of official proofer, whose task involves taste-testing Caslav’s food and drink for any signs of poison before it is consumed by the chancellor or his family. Then one day, the unthinkable happens. Both Chancellor Caslav and Etan fall to a powerful poison, one that is unknown even to Jovan and his extensive records of poisonous substances. Tain is called upon to take up his uncle’s mantle, despite the heir being young and untried. The Oromani siblings subsequently pledge to become his protectors, all three of them stepping dutifully into their new roles even as they grieved for their murdered kin. They are tested nearly immediately, however, as a sudden uprising sweeps across the city, resulting in a rebel army amassing at their gates. Very soon, Silasta finds itself under siege. Still reeling from the sudden loss of Chancellor Caslav, the population is thrown into further chaos. Few have faith that the inexperienced Tain will be able to save the city, but Jovan and Kalina are determined to help their friend weather through the attack. First the deaths of their uncles, and now this surprise rebellion—it all just seems too coordinated to be coincidental. Perhaps if they can find out who poisoned the former chancellor and his spymaster, uncovering the conspiracy might give them a chance at survival. Although it is rather clumsily executed, this novel’s aspiration to be a fantasy-mystery mashup is something I can appreciate. I also like the series’ focus on poison, a concept that is used both literally and figuratively in the narrative. Even as the story’s characters are dying from direct contact with poisonous substances, the city of Silasta itself is dealing with its own toxic situation. Something is rotten at its core, poisoning it from within and without. 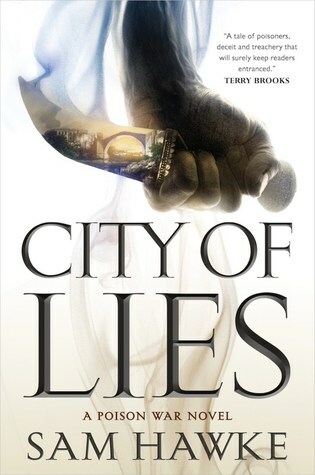 Told for the most part in alternating chapters in first-person between Jovan and Kalina’s perspectives, City of Lies is the story of the siblings’ efforts to sleuth out the ones responsible for the corruption in their midst. The book has elements of intrigue and spycraft, covert motives and betrayal, and eventually, a thread of magic even comes into play, though this aspect remains light and subtle throughout. In the end, my main issue with City of Lies was its pacing. At times, it would read like a tensely wrought thriller, while at others, the plot slowed to a crawl. The book also struggled to maintain its air of mystery—though, to be fair, when this atmosphere was present, the story practically oozed a rich and almost cinematic quality. But perhaps what bothered me the most about reading this was this frustrating sense of stop-and-go, since I found it difficult to work up my enthusiasm for the story and characters every time the plot lost its momentum. I also wouldn’t exactly call this one an action-oriented novel, with its heavy focus on cloak-and-dagger elements which proved to be a double-edged sword. Keep in mind Jovan and Kalina weren’t really trained to be fighters; instead, they were taught to be observant, to memorize crucial information, and to charm and manipulate opponents rather than to attack them with physical force. While it was refreshing to read about protagonists who rely predominantly on more clandestine tactics, occasionally it could get a bit tedious watching them spin their wheels. Speaking of which, I liked both Jovan and Kalina, but I found their POVs to be somewhat unbalanced. The focus favors Jovan, who appears to carry out most of the investigation, while his sister is relegated to tasks behind-the-scenes. Not that Kalina’s role in the resolution of the novel’s conflict was any less important, but it did feel as if she sacrificed a lot more, but her actions weren’t at the forefront due to the way this story was told. Already feeling overlooked, inadequate, and guilty because her health problems prevented her from taking on her rightful duties, her character probably deserved more attention from the author than she received, especially since Jovan’s chapters tended to be longer and more memorable the further we got into the book. For a debut though, City of Lies is undoubtedly impressive. Whatever flaws it may have, I also feel there’s a good chance many of them will be ironed out as we progress through the series, due to the way this one ended. A follow-up called Hollow Empire is apparently already in the works, and since I’m curious as to what the future will hold for Silasta and its characters, I’ll be looking forward to reading the sequel. Yup! Completely agree with everything you said here. Good to know I’m not completely off base 😉 It’s definitely a solid debut! Great review. I liked this and I think rated it a 4 although I did consider a 3.5. I definitely experienced the stop/start feel which slowed the read down a little for me at first but eventually I did become invested in the characters. Funnily enough, I was hooked immediately with that opening line and so at first I was loving it. And, although Kalina eventually worked her magic on me and I found myself caring for her I think it was her chapters that slowed things down for me at first. Like you said, Jovan stole the show a little and so I resented the change in viewpoint a little. I did think this was an intriguing start though. Yep, had the pacing been handled better, this would have been an easy 4 for me. And I agree with you about Kalina. I probably cared for her more than Jovan, but he seemed to be the one getting most of the attention. Hopefully the issues you had will be sorted in the next book! Me too! It looks promising though! Great review. I have this one in my TBR. Like Tammy, I’m wondering how I’ll like this one. I’ve seen a few different reviews. Yeah, I can see the opinions being mixed with this one. It’s just one of those books! One thing I really liked was the depiction of Jovan’s anxiety. That inner conflict was well done. Yeah, I have some of the same tendencies, so I really connected with him on that level. Me too. On both accounts. It was one of the best descriptions I have read. I loved these openers. They set the book off right. That is a heck of an opener. I’ve been seeing this one around quite a bit on Booktube, Long books don’t scare me but this one would be quite a commitment at 560 pages. Haha, long books might not scare you, but they sure scare me! It’s always a risk when you start books like these because you know you’re in it for the long haul (especially since I don’t DNF). The stop-and-go pacing concerned me a little, but luckily it all panned out. I remember your review! Yeah, I can see why you struggled, the pacing is a bit wonky. This one seems to be a hit or a miss for a lot of people! Age of Assassins has got me wanting more fantasy-mystery books, but I guess this one’s not quite up to par? Still quite curious about it, though! I’m definitely curious to check this one out!! I am intrigued by the world building and premise of this book, but got stuck at about the 40% mark when I read it a few months back because of the pacing. It felt like all of the characters hit a wall in the plot all at once. Will definitely have to come back to it when I am in the mood for a slower fantasy. Great review! Yeah, the pacing seemed to be the obstacle for a lot of people, including myself. I definitely agree with your description of the characters seeming to hit a wall at one point. The middle part of the book was where I really struggled.